a unique publication showcasing contemporary live art. Issue 4 features another selection of varied work from the world of contemporary performance art and performance theatre. Six videos with a total running time of just over 100 minutes. To read more about the featured artists scroll down the page. All issues of liveartwork DVD are available in both PAL and NTSC formats. To get a copy of liveartwork DVD issue 4 click on the 'order' link above. 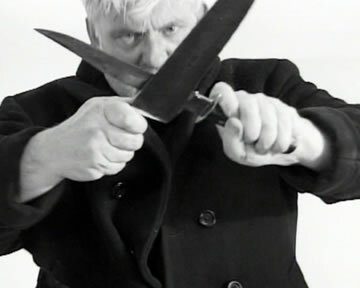 Born in London in 1948, Brian Catling is a poet, sculptor and performance artist making durational and short term installations and performances internationally. He has presented solo shows at venues including the Serpentine Gallery, Matt's Gallery, South London Gallery and the Ludvig Museum, Aachen. He is the founder of The Wolf In The Winter, a performance group which has worked in Germany, Spain and Greenland. He also makes narrative films with Tony Grisoni and is Professor of Fine Art at the University of Oxford. He is currently working on two new poetry books and a monument for the Tower of London as well as presenting work in Australia and Japan. ANTIC is an episodical work that grew out of a nervous twitch. The poem which divides the video was written to give an enigmatic side glance to the obsessive actions. It was made for camera and this version has never be seen. Gob Squad is a group of English and German artists who have been working collectively with performance, media and new technology since 1994. Gob Squad produces performances, installations, films, and live events. In our work pleasure and entertainment stand side by side with conceptual rigour and an uncompromising approach to artistic innovation. Gob Squad instinctively work in a variety of forms, making the framing of each project central to its artistic concerns. The company has always sought to produce and present its work outside of arts institutions, often siting its projects in urban environments such as offices, houses, shops, hotels and railway stations, as well as producing work for radio and internet broadcast and pieces for galleries and theatres. Room Service is a live interactive film. In the conference room of the hotel the audience watch four performers on four huge TV monitors set side by side. Each performer is in a separate hotel room, unable to see and hear the audience or each other. It's late at night, and none of them are sleeping, instead they kill time, sharing moments of hope, fear and boredom. Their only contact to the outside world is a phone line that puts them directly in contact with the audience. As the night progresses they call their voyeurs with increasingly absurd and desperate demands, in a plea to remain with them and help them make it through the night. Gob Squad work collectively, without a director, on the concept, design, devising and performing of their work. Permanent members of the group are Sean Patten, Berit Stumpf, Sarah Thom, Simon Will, Bastian Trost and Johanna Freiburg. Other artists are invited to collaborate on particular projects. For Room Service, Gob Squad are joined by performance/video artist Elyce Semenec and sound designers Sebastian Bark and Jeff McGrory as well as video artists Miles Chalcraft and Leif Alexis. Room Service is co-produced by Gob Squad, Kampnagel Hamburg and Podewil Berlin. With financial assistance from Kulturbehoerde der Freien und Hansestadt Hamburg, Senatsverwaltung für Wissenschaft, Forschung und Kultur Berlin and Fonds Darstellende Kuenste e.V. Bonn. Julie Andrée is a Montréal based artist who situates body and space at the core of her research, which is manifested through installation and performance. Between the poetic and daily life, her work proposes common yet recognizable abstract zones, to invest different fields of questioning at once cultural and existential. Since 1994 she had been presenting her work all over. She is been performing with Black Market International since 2002 and collaborates with various groups and artists including PME, Poni, Dominic Gagnon (film-maker) and Benoit Lachambre (choreographer). Original performance duration: 35 mins. Toronto based artists Paul Couillard and Ed Johnson have been collaborating on the Duorama series since 2000. Parallel to their solo performance art practices, Couillard and Johnson have produced over 100 Duorama works in Canada, France, Poland, Croatia, Ukraine, Belarus, Finland, Germany, Switzerland, Spain and the USA. Duorama explores notions of relationship. Playful and minimalist, the pieces draw on the collaborative and competitive tensions that underlie partnerships while also responding to site. Often the works can be read in terms of the social and political climate surrounding gay culture, offering askance references to issues such as gay marriage, HIV-status and male intimacy. Duorama #91 was developed in response to curator Jim MacSwain's focus on "anxiety and foreboding in Canadian performance art practice". Presented by the Centre for Art Tapes as part of "Fear and Fury" performance series, curated by Jim MacSwain. Original performance duration: 60 mins. Born in Turkey 1970, Nezaket Ekici has lived in Germany since 1973 where she works between Berlin and Stuttgart. Since 1998 she works with performance, installations and video and has presented work in Europe, America and Asia. Her work addresses several topics including that of cultural identity (German-Turkish), living sculpture and art in the sense of synthesis (Gesamtkunstwerk). In 2004 she graduated as Master in Performance with Marina Abromovic at the Hochschule für Bildende Künste Braunschweig. 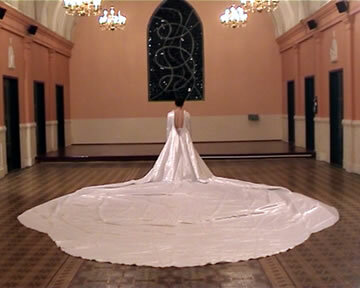 The artist stands with the back to the viewer wearing a wedding dress eight meters long and six meters wide. In a work of Sisyphus, she desperately tries to pull up the long zipper on the back of the dress. Because the dress is deliberately made to be tightly fitting in the sleeve, shoulder and hip, it is impossible to close the zipper. With the use of microphones, the noises of the zipper and breathing become audible. During 40 minutes, the viewer is torn as to whether to help or not. In the end the artist asks the audience to help her and eventually it takes three people working together to finally close the zipper. Original performance duration: 40 mins. Based in Basel, Switzerland, Saemann works with video, installation and performance as well as working as a curator and teacher. Amongst other projects she was the co-coordinator of Kaskadenkondensator - space for contemporary art, performance and music in Basel (www.kasko.ch); co-curator with Annina Zimmermann of Helle Nächte (Light Nights) (www.xcult.org/helle) and co-curator with Lena Eriksson of lodypop, an artist run space focussed on artistic processes (www.lodypop.ch). She has also been visiting professor at the HGK Basel, Department of Visual and Media Arts. Since 2002 she has worked on her project Generation Gap - personal encounters with women pioneers of Performance Art from the 1970s (including interviews, performances and events). "In the performance I tell about my meeting with Carolee Schneemann in New Paltz, N.Y., in September 2003. I talk about how she styled her body and was photographed in her New York studio by the Icelandic artist Erró as part of her painting and installation work (Eye Body 1963). I come into the picture myself and act out the performance Interior Scroll (1975 and 1977). I read from the book Cézanne she was a great painter (not shown in the video), pull the writing out of my body and speak the dialogue with the Structuralist filmmaker. When he dismisses Carolee as a dancer, I dance Punk until I am out of breath. I am surprised at how much performance history is fixated on the photograph of Interior Scroll while neglecting to transmit the content of the discussion between her and the Structuralist filmmaker. And yet the title of the piece stresses the importance of the written word." Original performance duration: 45 mins. © liveartwork 2006. All Rights Reserved.